Gretchen Whitmer, a Democrat running for governor, says she would end an easement that allows the Line 5 pipeline under the Straits of Mackinac. Democrat Gretchen Whitmer is proposing debt-free community college for Michigan residents and better safeguards for the Great Lakes and drinking water should she become governor. 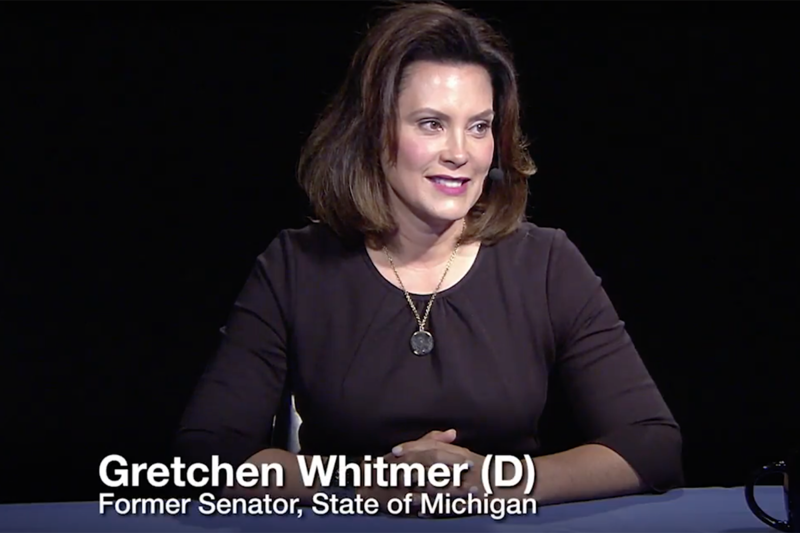 Bridge Magazine interviewed Whitmer, the former Senate minority leader from East Lansing, for more than an hour last week along with its partners in the Detroit Journalism Cooperative: Detroit Public Television, Bridge Magazine, Michigan Radio, WDET Radio, New Michigan Media and Chalkbeat Detroit. What follows is a transcript of Whitmer’s interview. Any grammatical and spelling errors are those of the transcription service. Christy McDonald, Detroit Public Television: We’d like to welcome Gretchen Whitmer, Democratic candidate for Governor. Thanks so much taking part in our gubernatorial candidate interviews. I’m Christy McDonald with Detroit Public Television. In the room today and doing the questioning are members of the Detroit Journalism Cooperative. The DJC is made up of six media outlets. Detroit Public Television, Bridge magazine, Michigan Radio, WDET Radio, New Michigan Media and Chalkbeat Detroit. We would like to thank the John S. and James L. Knight Foundation for it’s support on this project here today. Today’s panel includes and starting to my left Sascha Raiyn. She’s the education reporter at WDET and she’s representing Chalkbeat Detroit. Riley Beggin, she’s the politics reporter at Bridge Magazine. Steve Carmody, he’s a reporter and producer at Michigan Radio. Hassan Khalifeh, he’s a reporter with the Arab American News and New Michigan Media. And Sandra Svoboda from WDET Radio. For the next hour each journalist will a series of questions and follow-up on your answers if they do need some more specifics. And we appreciate you keeping your answers concise so we can get to as many topics as possible. I will give us a 30-minute time reminder so we can stay on track for this next hour. Christy McDonald: Let’s start off and I wanted to start off a little bit talking about leadership and responsibility. Much has been made of the management style of previous governors, a de facto head of the party with strong arm tactics of getting things done, to our current governor who has been criticized for not being as politically savvy as he needed to be. First off, explain what your management and leadership style is. Christy McDonald: So how do you see the governor’s role, just in terms of the Democratic party? Do you see the governor as the head of the Democratic party in Michigan and carrying out what that agenda will be for the party? Christy McDonald: Alright. Let’s go ahead and take a look at some of the biggest issues facing the state right now is education. A lot of people are talking about it. So I’m going to go over to Sascha for the first question on education. Sascha Raiyn: Several of our listeners have questions about education and Judith wanted to ask specifically about what your plans are for schools. Do you believe that schools in Michigan have what they need to succeed and to serve all students including special needs students? And do you think that schools are funded equitably? Sascha Raiyn: Let me ask about testing, about accountability systems. They are often really focused on the socioeconomics as opposed to what’s really happening in schools. Sascha Raiyn: How would you weight? How would you use accountability systems in schools? Gretchen Whitmer: There's no question that we have to measure to see what’s working and what’s not working. I mean this is not just an experiment. This is about setting our kids up for a lifetime of health and wealth and opportunity or failing them and setting them up for you know the other trajectory. And that’s unconscionable. But we have to know what’s happening and to be able to measure. The standardized tests that our kids are taking and taking and taking aren’t being used to really make tweaks in the curriculum or in the teaching or in the investment in our schools. It’s being used as a tool of punishment. We’re over testing. Christy McDonald: Gretchen, are you suggesting that we should be changing the standardized testing? We’ve already gone from the MEAP to the M step. Are you suggesting another change? Christy McDonald: Sascha talked a little bit about accountability. Let me ask you this. Should the state be making school closure decisions? The Michigan Department of Education. Should we be at that level, that they’re making the decisions of what schools should be closed down not based on achievement. Christy McDonald: Let’s talk a little bit about Detroit public school’s community districts. Steve. Stephen Carmody: Obviously Detroit has the largest public-school district in the state, recently released a facilities report saying that it would cost half a billion dollars to bring the districts’ school buildings up to current standards. But the state law gets in the way of that. It won’t let the district borrow money to do those types of renovations. What should Lansing do here? Should Lansing make it easier for the district to borrow money? Or should Lansing step up and help pay that very large bill? Gretchen Whitmer: I think that’s an important and great question. When I was in the legislature, I introduced year after year the ability to open up the purposes for which sinking funds can be used. It’s such a limited purpose and there are so many districts that have balances. Now I don’t know what Detroit public schools’ circumstances are on that front in particular. So I don’t know if this would have helped alleviate that. But I’ve been throwing solutions on the table for a long time. I’ve been in the minority and unable to get them signed into law but that will change after this election. I believe we’ve got to give districts some flexibility to raise the revenue if they can. But it’s on the state to ensure that every child has a good facility in which to learn. That the quality of the facility has a direct impact on the quality of education that’s happening within in. I do believe ultimately the role is of our state government to ensure every child in this state has a great public school education. Despite what the federal court said, despite what Bill Schuette and Governor Snyder say, I believe every child in this state has a constitutional right to literacy. I believe you have a birthright to a good education. And it includes having a great teacher in your classroom, having facilities that promote the kind of learning that today’s day and age requires. All of these are pieces of that. And until we get that right, nothing else matters. I mean there are things that matter. I guess that’s an overstatement. But until we get that right, we’re not going to realize the real economic possibilities in this state because we’re not getting the core, the backbone of our society. It’s not strong enough. And it’s hurting our ability to draw people into our state. It’s hurting our ability to lift people out of poverty within our state. And it’s holding families back. Stephen Carmody: But how much should taxpayers in Grand Rapids and Mount Pleasant up in the UP contribute to the quality of Detroit public schools? Should that just be something that the citizens of Detroit have to take care of? Or is it something because it is such a large bill that does have to be spread out at least somewhat across the state? Hassan Khalifeh: Do you think Michigan should make reforms to laws regarding how charter schools are governed and funded? Hassan Khalifeh: So then you don’t think that funds allocated for public schools should be used to fund charter schools? Sascha Raiyn: What can the state do to make preschool and childcare options more accessible and available and affordable? Gretchen Whitmer: Um hum. One of the things that we have proposed in my jobs in the economy plan is drawing down more resources from the federal government. Right now we could be giving tax breaks to families for childcare and we’re not. We could expand early childhood education which starting our kids off as four-year-olds would help alleviate some of that. There are a lot of different things that are available, even from the federal government, that we’re not making use of here in Michigan. Sandra Svoboda: Well, we’ve talked about K12 education. You just talked about early childhood and childcare. Let’s turn to higher education. Do you believe that the cost of higher education in Michigan is cost prohibitive now? And if so, what would you as governor have the ability and wherewithal and agenda to do about it? Gretchen Whitmer: Well, it is. I mean it just is. When I went to Michigan State University, the taxpayers I think picked up about 70% of the cost of my education. And it was on me and my family to come up with the rest. Now it’s just about flip flopped. And we’ve had this mindset in the last 20 years that the only way to a career, an honorable career that you can make a good living in is through a four-year degree. And so we’ve kind of pushed this mantra out there and stigmatized other paths and now we’re paying a price for it. Because we created this assumption and then we cut out people’s ability to afford it. So now here in Michigan, the state that used to have the most skilled workforce on the planet, we have too few people in four-year degrees. We have too few people in two-year degrees. We’ve got too few people in the trades in Michigan. Yes, I believe that it’s critical that we open up all those paths. So one of the pieces of my plan is the My Opportunities scholarship which is a path to a two-year degree, a debt free two-year degree for every Michigander. We can that kind of investment toward bringing down the cost of a four-year degree and also opening up paths into the skilled trades. We’ve got to make it real, make it affordable for people to pursue whichever is their path. There is honor. You can make a darn good living in the trades. You can make a good living, we’re looking for nurses in Michigan. I mean I know in the paper today the anticipated shortage of sales reps, of truck drivers, of nurses, I mean of all these walks. There’s a good living to be made in this state but we’ve got to help people get the skills so that they can get into those better paying jobs. Christy McDonald: Just a quick follow-up so everyone will think wow, we can all get a two-year degree. How are we all going to pay for that? Christy McDonald: So you take the money from the Rainy Day Fund for that? Christy McDonald: Okay. Before we turn to some more policy specific questions, I want to ask about the workings of Lansing. You know Michigan’s term limit will cause mass turnover. How challenging do you think the loss of institutional knowledge will be? And as governor, how will you and your staff prepare to work with new lawmakers? Christy McDonald: Speaking of roads, we’re going to get to that, roads and infrastructure right now. So I’m going to turn it over to Riley for that first question. Riley Beggin: Yeah, it’s a perfect segue. Anyone who drives our roads here in Michigan knows that they are really bad. A task force says the state needs $4 billion more just to maintain our infrastructure here. How should Michigan pay to fix roads, bridges and water systems? Riley Beggin: You mentioned those mechanisms that you suggested in the legislature. For people who maybe weren’t watching that at that time, could you talk a little bit about what those mechanisms are? Riley Beggin: Okay. We’re going to talk a little bit about Flint. As the recovery efforts continue there, what have you learned from the situation and how would that inform what you do as governor? I was in church in Flint last Sunday and a woman rolled up her sleeve and showed me this horrible rash on her arm. She said her kids’ arms are worse. We haven't done our job yet to fix it. Christy McDonald: Water quality was going to be the next part of our conversation. Steve, is there something that you want to add to that coming out of some of the questions and answers that Gretchen gave? Stephen Carmody: Well, it is a big question and the Great Lakes are a critical resource for the state of Michigan and you did touch on somewhat what you plan to do to address water issues in general. But I want to stay with the lakes in particular. You mentioned Line 5. What else are you looking at that you’ll have to do as governor to safeguard the quality of our Great Lakes? Riley Beggin: What are your plans for the future of Line 5? Christy McDonald: What is your solution for the delivery of that petroleum product then? If you don’t think that there should be a tunnel, are you looking at trucking? Or what is the solution then to move a resource that people use? Hassan Khalifeh: You mentioned PFAS already. I wonder exactly how do you intend to combat water contamination caused by industrial chemicals like PFAS? Christy McDonald: Okay. We’re going to move on to some topics on immigration. Hassan. Hassan Khalifeh: Governor Snyder established the Michigan Office for New Americans in 2014 to attract and retain global talent. He declared June as Immigrant Heritage Month this year. Exactly how do you plan to attract more families to come to Michigan given that we might lose a congressional seat due to population decline? Gretchen Whitmer: Well immigration is so fundamental to who we are, who I think we are, as Americans, to what we were founded on. It is fundamental to our state as well. You know Michigan is the place people used to come to from around the world for opportunity. My in-laws came from Kentucky and Tennessee and Alabama like a lot of people did. By you know people came from Lebanon to Dearborn. People came from Finland to the Upper Peninsula. From Holland to the west side of Michigan. And on and on and on. And that’s why we’ve got this rich diversity and such wonderful culture here in Michigan. Hassan Khalifeh: Would refugees be a part of that plan? Hassan Khalifeh: So then you would support the EB-5 visa program? Christy McDonald: Alright. Let’s move on to taxes and some tax incentives taking a look at the state. Riley. Riley Beggin: Many people in our audience wanted to know about taxes, insurance and finance issues. From our audience member John, do you believe that economic development deals with tax credits, incentives, etc. are necessary and useful for Michigan’s communities? Riley Beggin: Would you suggest some sort of transparency? What would you recommend for a transparency process in that regard? Stephen Carmody: The economy is doing well now but, in all likelihood, there probably will be a recession sometime in the next four years. How will you as governor prepare the state to weather that storm? Stephen Carmody: Is raiding the Rainy Day Fund before it starts raining a good idea? Gretchen Whitmer: Well, Steve, you know it’s raining for people in Flint. What does that mean? Does building up and having a great credit rating mean much if you have a city full of families that still doesn’t trust the water coming out of their taps? Does it mean much if your roads are turning to gravel? Does it mean much if you’ve got a hundred communities that can’t drink their water? My answer’s no. I’m not suggesting that we use that to fund all the priorities I’m talking about because it’s one-time funding and we have to build in long-term solutions and be honest about what it’s going to take to do that. But to your point about the rainy day and an economic possibility of recession in the future, I think we’ve got to get serious about making the long-term commitments and investments in us so that we can weather a storm. Christy McDonald: Sascha, you have a question about auto insurance? Sascha Raiyn: Yes. Debbie and Ray in our audience want to know what your plans are for auto insurance and specifically how you might lower the rates? Gretchen Whitmer: Yeah. There’s no question that the cost of auto insurance for Michiganders generally is tougher than the rest of the country, but Detroiters are feeling it the worst. I hear about it everywhere I go. People say my car note is a half of what my auto insurance is. That’s rent. That’s childcare. That’s a lot of different things that are going toward just the bottom line of an insurance company. Sandra Svoboda: Interested in talking about transit, especially as our state is so diverse in terms of urban, suburban, rural areas. I’d like to hear a little bit about transit policy for the entire state and also because southeast Michigan specific with the RTA issues. We’ve got bad roads. We’ve got crazy cost of insurance. And lack of transit for people that is solid and reliable. That’s keeping hardworking people from getting into good paying jobs. Regional transit is very important. It is something that I do support. And it’s something that as governor, I’m going to work with the leaders of the county and Mayor Duggan and the county execs to get it done. Christy McDonald: Alright. You talked a little bit about transparency earlier. We have some specific questions on that. Riley. Riley Beggin: What’s your stance on the ballot measure to create an independent citizens redistricting commission? And if you oppose the Voters Not Politicians initiative, what solution would you suggest to address gerrymandering? Christy McDonald: And Sandra has some more specifics on FOIA. Christy McDonald: We just have a few minutes left here. So we’re going to tackle one more issue. Marijuana. Steve. Stephen Carmody: This fall Michiganders vote on legalizing recreational marijuana. What’s your thoughts on that? And if it passes, how would you as governor make sure that the rollout works? Stephen Carmody: Any concerns about the potential social effects of legalized recreational marijuana? Gretchen Whitmer: Oh absolutely. There’s always concern and the biggest concern is ensuring that it stays out of the hands of kids, you know as their brains are developing. But there is so much unknown around marijuana because it’s been illegal for so long that the studies haven't moved forward the way that we really should have. Some of the stuff they’re doing across the world is really encouraging. It can be used as an exit drug. We’ve got an opioid epidemic here in Michigan. I think that there are so much unknown but certainly that creates a lot of concerns as well. Christy McDonald: Alright. We want to wrap up with some fun questions. I know this has all been a lot of fun. [laughter] But we’re going to wrap up with just some really quick fun questions from everyone. So who is going to start us off? I think Sascha, you are going to start us off. Sascha Raiyn: So we’d like to know what make and model you drive and people in your family drive? What are the cars in your life? Gretchen Whitmer: Okay. So I drive a Ford Expedition. It is enormous but I’ve got three stepsons, two daughters and a husband. I like it because I can get all my stuff and people in it. My husband drives a 10-year-old Yukon. It has a huge dent in the back because well, he had a mishap and that’s that. Yeah, I’ve always been a GM purchaser until I bought this Ford and I love my Ford Expedition and my husband loves his GM car so. Gretchen Whitmer: At the risk of sounding like I’m pandering, I love Vernors. I really do. My mom gave it to us when we were sick. We ate it with ice cream when we were celebrating. I mean Vernors is the thing and my sister is in from New York and is stocking up on Vernors too. Riley Beggin: What book are you reading right now? What’s on your nightstand? Gretchen Whitmer: Actually, it’s not on my nightstand. It’s an audio book I’m listening to and it’s Dr. Mona’s book, “What the Eyes Don’t See.” It’s really good. Stephen Carmody: When you're not campaigning, what’s a good weekend? What do you like to do? Gretchen Whitmer: I like to hang out with my family. My kids are teenagers so they’re rarely up before I leave the house and so we Facetime later on. I live near my dad. He’s got a pool so sometimes we’ll go over there and hang out by the pool or go to the water. I’m always drawn to the water. Christy McDonald: And what was your first job? Christy McDonald: Alright. Well, that is going to conclude our conversation with Democratic candidate for governor, Gretchen Whitmer. Many thanks to the John S. and James L. Knight Foundation for its support. On behalf of the Detroit Journalism Cooperative, I’m Christy McDonald. Thanks so much for joining us. We appreciate it. Gretchen Whitmer: Thank you all. Christy McDonald: Thank you for your time. I know that’s a long time. Transferred education funds to the general fund.) I also just learned that Gretchen is taking the strongest stance on removing the potential threat of a major oil spill in our Great Lakes by disallowing the easement for the infamous, obsolete #5 Enbridge pipeline near the Mackinac Bridge. By the way, Gretchen wholeheartedly wants to get rid of partisan gerrymandering, which encourages me soon after to get involved collecting signatures for Voters Not Politicians. Her team member responded within minutes when I had questions about Nestle and Enbrudge water issues and about her most recent statements about gun control. She really cares about us (as well as her husband and 4 chikdren)! A fine example of what voters need to make an informed decision . Gretchen’s interview showed her vision of what she wants to accomplish as Governor. Impressive comments relative to education, fixing Michigan roads, the Flint water crisis, auto insurance and so much more. Very informative and I thank you. I'm not interested in another neoliberal. We need progress - not moderation, and certainly not more capitulation to the Right! I concur with Lucille and Jean on most of this interview. It is measured. Ms. Whitmer is in reasonable control of almost every issue that has been thrown her way. My only regret is this statement: "I do believe the role is of our state government to insure every child in this state has a great public school education." On that, I think that she goes overboard and unfortunately strengthens a highly orchestrated public expectation that somehow, education is just another public service, and that all of those public educators are somehow professionally capable of educating each and every child to some Constitutional degree of competency. It has always been my insight that truly effective education always requires that there be a long and lasting bonding and intense collaboration between parents, among themselves, as well as with the teachers of their students. Any political statement which ignores that need, only fuels a general public and media expectation that somehow, professional educators can do the job alone. Just drop your kids off and we will do the rest!!! This is, of course, the kind of nonsense in which Mr. Schuette delights with his defense of the marketplace as the paramount solution.